We start in Castle Blackwhere Edd is trying to talk Jon Snow into walking back his dramatic exit last week. 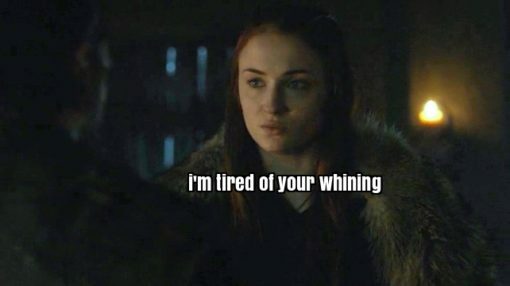 Jon is pretty set on leaving his trauma behind him cuz that’s what dying does to you, but they are interrupted by the horn announcing a visitor: Team Sansa!!!! Jon:I met cannibals. Also zombies. Sansa:I was sold into three terrible marriages. Jon:I had to betray the woman I love. Then she was killed in front of me. In the Vale we catch up with Robin Arryn who has grown tall but is awful at bow so like his uncle Edmure (#WhereIsEdmure) he has no chance of winning in this big mean world. Petyr Baelish reappears with the birthday gift of a falcon and I briefly thought we had a Jace Wayland moment on our hands but it’s more a distraction than a lesson. Ser Royce accuses Baelish of handing Sansa over to the Boltons, but this is Littlefinger so he just accuses Royce right back and Robin backs him up because Uncle Petyr just gave him a pet predator. Royce gets out of being thrown through the Moon Door by swearing fealty to Baelish by way of Robin. Petyr informs them Sansa has now escaped Ramsay and fled to Castle Black. Robin, at Petyr’s urging, decides to mount a rescue and House Arryn is finally in the war. In Mereen. . . SIGH. 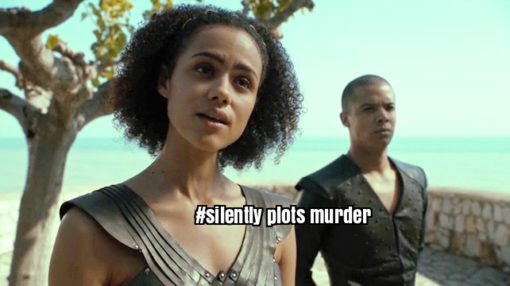 Missandei and Grey Worm get some powerful stuff in these scenes – my favorite being their reaction to Tyrion saying he’s been a slave so he knows slavery is bad. 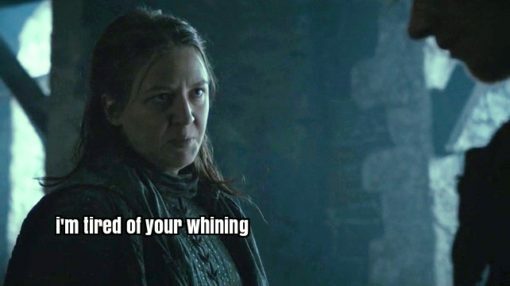 Missandei and Grey Worm were born into slavery and lived as slaves until about a year ago while Tyrion was born into one of the wealthiest and most powerful families in Westeros and was a slave as part of a ruse to get to Daenerys for about five minutes so. Meanwhile, Dany and the widows have the same conversation they’ve already had twice – Dany has no power and will be lucky to stay with them – but also introduce a new character, a widow Dany’s age who was taken by her Khal at 12. Dany bonds with her instantly and they head outside the temple to talk dragons. At which point Daario and Jorah show up to smuggle Dany away. But the woman of a hundred titles has her own escape plan and gets the other three on board. Margaery is taken from herjail in King’s Landingto meet with the High Sparrow. I don’t really know what happened in this scene because Jonathan Pryce orating nearly put me to sleep. I am as weary of the High Sparrow as the Lannisters and Tyrells are. But Margaery is rewarded for not falling asleep in his presence with a visit to her brother and I get sibling reunion number two! 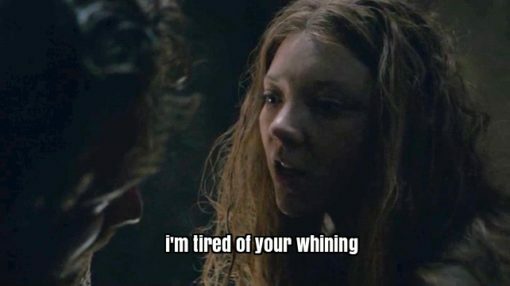 The two have very nearly the same conversation as Sansa and Jon: Loras is defeated and Margaery tells him to get over it, they need to fight. In the Red KeepCersei gets Tommen to tell her what’s going on and learns Margaery is getting set to endure her own Walk of Shame. Cersei, with Jamie in tow, uses this info to get back into the inner circle of Kevan Lannister and Olenna Tyrell. They plot to have the massive Tyrell army show up to save Margaery and the Lannisters will stand down and let it happen. Cersei preys on Kevan’s desire to get his son back from the Hyenas and despite his misgivings he agrees to the plan. The Lannister theme song plays as the crew decide a riot in the streets is better the religious stalemate they’re currently stuck in and it’s super effective. In WinterfellRamsay murders Tonks. 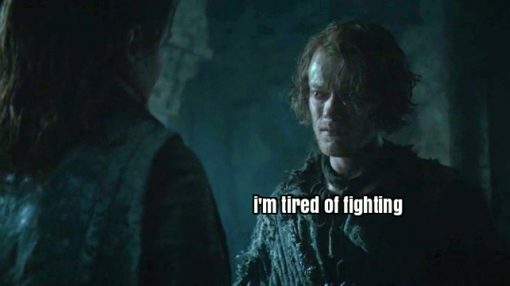 And then sends a letter to the Lord Commander in Castle Black. 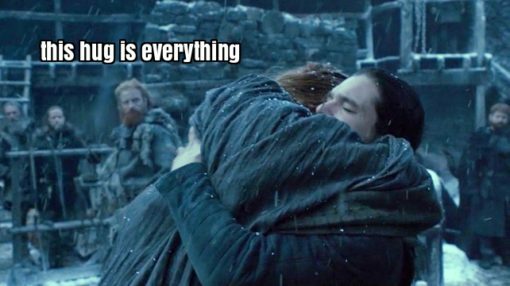 He tells them he has Rickon in his dungeon and unless Jon gives him Sansa he’s going to destroy them all. His threats are explicit and delivered as a kind of poem which is so Ramsay. Ramsay’s army is at least 5000 and Jon’s fighting wildlings number around 2000 but Sansa believes the North will rally for Jon if he asks. 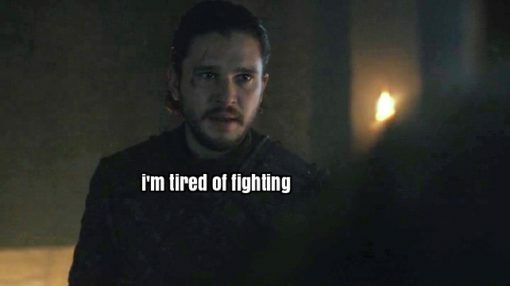 Jon finally agrees to take a stand. And we end back with the Dothrakiwhere the council of Khals have learned nothing and discuss Dany’s body and what they want to do with it in front of her. Dany smiles, explains the simple concept that Khal Drago >> all of them and Queen Daenerys >>>>>>>>>>>> Khal Drogo. Then she tips over the fire pots and sets fire to the temple. 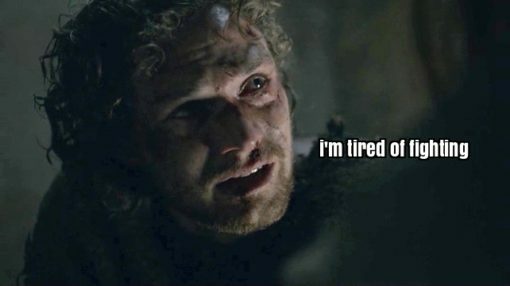 Daario and Jorah have taken care of the guards and the barred the doors and her enemies all die screaming the way Dany promised way back when. She walks out of the fire and like that Daenerys went from prisoner to leader of the entire Dothraki nation. Don’t mess with Team Dragon.